The flip the other day was tasty…but today when I finished my first final and it was freezing out I wanted nothing more than a hot toddy. A classic hot toddy is just hot water, whiskey, and a sugar cube: it’s kind of an old man drink. 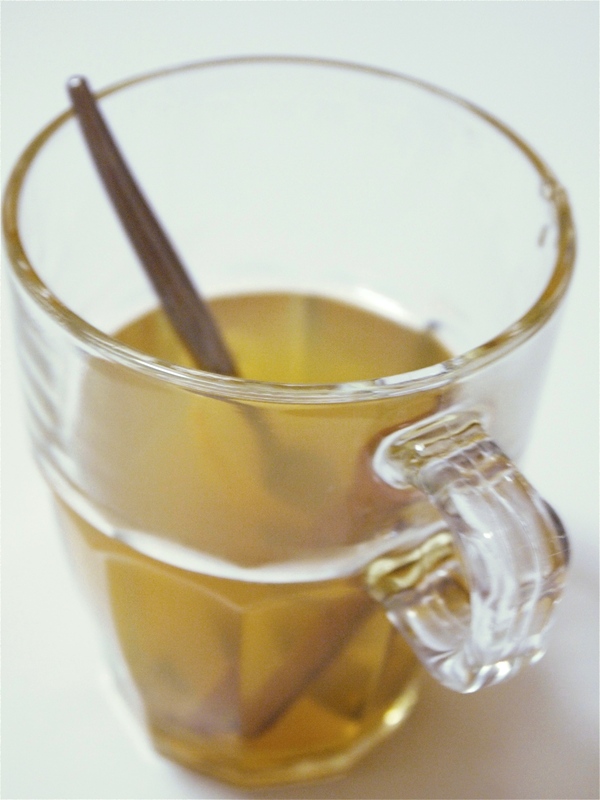 I spice mine up a little by using honey and lemon juice, and tossing in a few cloves and a cinnamon stick. It’s all very free-wheeling: try it yourself and adjust the ingredients to taste! Maybe start with 3 oz. hot water, 1 oz. whiskey, a half tablespoon of honey, and a squeeze of lemon. Adjust to taste! In other news: after finishing my exam down at NYU I was wandering around in a daze. My feet, of course, led me to Broadway Panhandler. Which was having a sale. I successfully resisted the lure of new jelly roll pans and Silpats, but I did let myself get a couple of these cute vintagey Duralex glass mugs. I grew up with Duralex glasses and have always found them kind of comforting. Especially when filled with hot toddy.